We are happy to announce another long awaited improvement to the GBIF portal. Our portal test environment now shows multimedia items and their metadata associated with occurrences. As of today we have nearly 700 thousand occurrences with multimedia indexed. Based on the Dublin Core type vocabulary we distinguish between images, videos and sound files. As has been requested by many people the media type is available as a new filter in the occurrence search and subsequently in downloads. For example you can now easily find all audio recordings of birds. If you follow to the details page of any of those records you can see that sound files show up as simple links to the media file. We do the same for video files and currently do not have plans to embed any media player in our portal. This is different from images which are shown in a dedicated gallery you might have encountered for species pages before already. 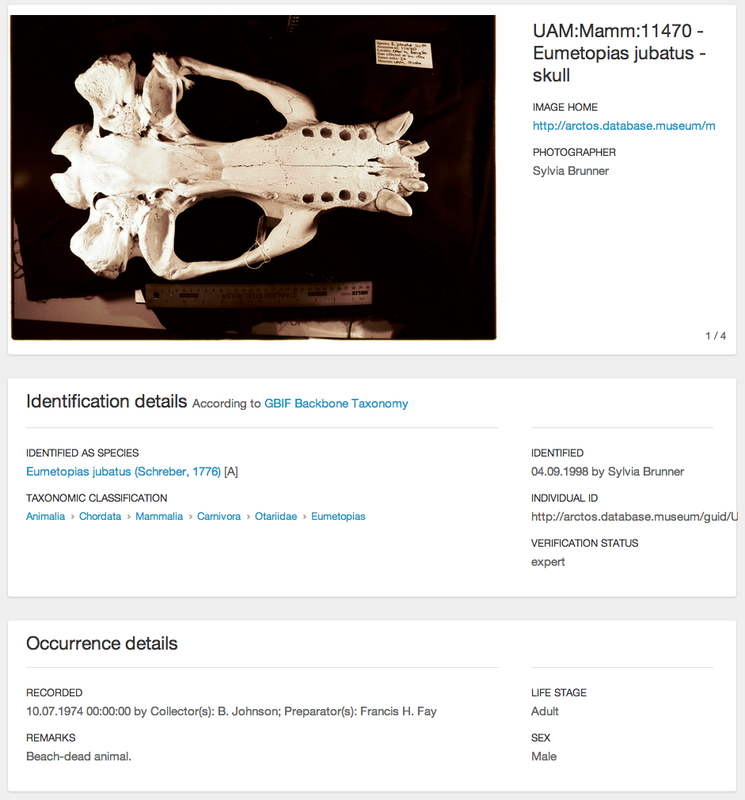 On the left you can see an example of a skull specimen with multiple images. When requested for the first time, GBIF transiently caches the original images and processes them into various standard sizes and formats suitable for the use in the portal. 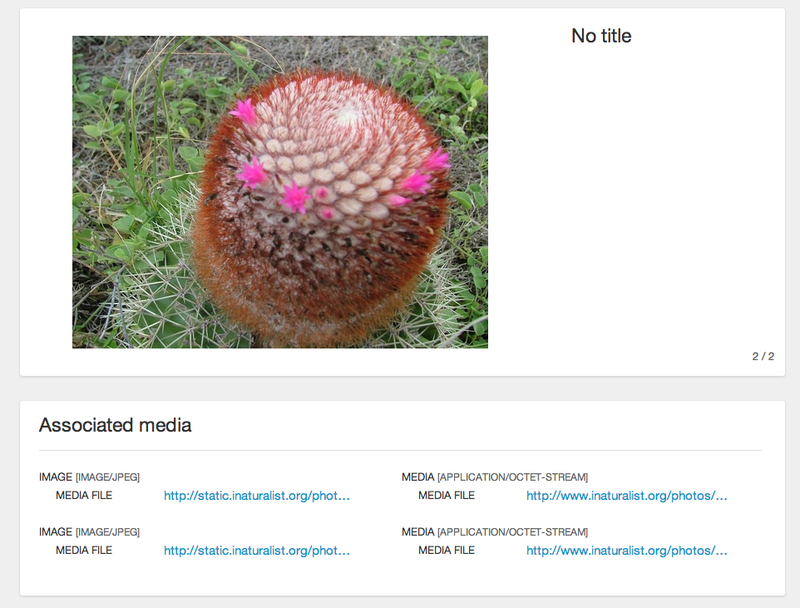 GBIF indexes multimedia metadata published in different ways within the GBIF network. From a simple URL given as an additional field in Darwin Core via multiple items expressed as ABCD XML or a dedicated multimedia extension in Darwin Core archives the difference usually is in metadata expressiveness. As usual we also provide a binding from the TDWG ABCD standard (versions 1.2 and 2.06) mostly used with the BioCASE software. From ABCD 1.2 we extract media information based on the UnitDigitalImage subelements. In particular information about the file URL (ImageURI), the description (Comment) and the license (TermsOfUse). In ABCD 2.06 we use the unit MultiMediaObject subelements instead. Here there are distinct file and webpage URLs (FileURI, ProductURI), the description (Comment), the license (License/Text, TermsOfUseStatements) and also an indication of the mime type (Format). The bird sound example from above comes in as ABCD 2.06 via the Animal Sound Archive dataset. You can see the original details of that ABCD record in it's raw XML fragment. There are also fossil images available through ABCD. Missing from both ABCD versions is a media title, creator and created element. We derive the media type from either an explicitly given dc:type, the mime type found in dc:format or the media file suffix. In the case of dwc:associatedMedia found in simple Darwin Core we can only rely on the file URL to interpret the kind of media item. If that URL is pointing to some html page instead of an actual static media file with a wellknown suffix the media type remains unknown. We hope you like this new feature and we are eager to get this out into production within the next weeks. This is the first iteration of this work, and like all GBIF developments we welcome any feedback. Note that Darwin Core metadata can be directly imbedded in multimedia files as XMP. Exiftool implemented this in early 2013 and it will be implemented in exiv2 starting with version 0.25.